The second annual Runway best dressed award was a close call, but the nod this year goes to UConn's own Dan Davis, looking dapper in a phenomenal black pinstripe suit. I congratulated Dan on his choice, and he said he'd been hearing compliments all morning. Runner-up goes to Rutgers Ray Rice, who wore a black suit similar to Davis'. But Rice lost points for the neon green pinstripes. A little much. Wish I took a picture. All reports are that Tyler Lorenzen's knee is fine. Randy Edsall expects him to be ready to go come August 5. In other quarterback news, Edsall said Dennis Brown enunciated better in the huddle this spring. During his two starts back in 2005, Brown had trouble with his voice infliction. As then-offensive lineman Grant Preston reportedly said after returning to the sidelines that year, "Coach, no one knows what the (expletive) he's saying!" Not the case any more. "They're understanding that Florida twang a little better," Edsall said. Edsall couldn't comment on Notre Dame transfer Zach Frazer, per NCAA rules, because he's not yet enrolled in classes. He'll be there by August 5. Here's what Edsall had to say about James Nixon, "He didn't make it, went to prep school and still didn't make it. In a situation like that, we stood by him and everything else. In my opinion, I just didn't think, based on the whole story, and all the information we had, that it was going to be a productive situation for him or for us and it was better served for him to pursue other options." Edsall explained he's willing to take chances on borderline academic kids if he sees they display a work ethic and willingness to be successful in the classroom. In a scenario in which it appeared more and more likely Nixon would be an ongoing academic liability, Edsall felt it would be best to allow Nixon to pursue his career elsewhere. Nixon and his family, as reported earlier in the Register, said the feelings were mutual. Rutgers coach Greg Schiano, who threw out the first pitch at Yankee Stadium before a game with the Mets on June 15, said he's a lifelong Yankees fan who was in the upper deck nosebleeds the night Reggie Jackson belted three homers against the Dodgers in the 1977 World Series. Schiano was able to relay the story to Jackson, whom he met at the Stadium before the first pitch last month. I needled West Virginia's Steve Slaton last year for sounding like he just woke up during a conference call with Connecticut media in October. Well, Slaton was a much better interview this time around. Outgoing, chatty, insightful. Only this time, Slaton looked like he just rolled out of bed with his new hairstyle. Think Don King without the gray. Hope he keeps his helmet on for TV interviews. New Louisville coach Steve Kragthorpe must have spent last night brushing up with his coachspeak dictionary. No cliche went unturned. I stood at his table for nearly 10 minutes, and wrote nothing. Oh, he did say that the plan is for Brian Brohm to start at quarterback while backup QB Hunter Cantwell would be on the sidelines next to him. Stop the presses. Dan Davis and about 20 teammates are taking karate lessons this summer with a man known only as "Sensei". But I was disappointed to hear the guys aren't rock ing the white karate suits at the dojo. Too bad. As was mentioned earlier in the press conference by Edsall, the captains will take some burden off Edsall by handling the disciplinary aspects of those late to meetings and workouts. 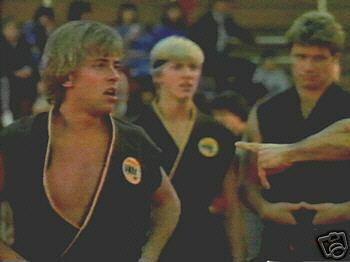 How great would it be if they did this while walking around campus in custom-made karate suits like the Cobra Kai? It's not too late. I'm starting a collection. We need to make this happen. Sorry to focus on Davis so much, but he was chock full of great information Tuesday. One thing he learned from "Sensei" is you can figure out everything about your opponent with one glance into their eyes. Davis was even so kind as to demonstrate on Neil Ostrout from the Connecticut Post with a quick, hard glance. Personally, I thought Neil displayed the eye of the Tiger. Davis thought otherwise. He said he could see Neil was already defeated and wouldn't have stood a chance. Hang in there, Neil. Larry Taylor is playing mentor to Robert McClain and teaching him everything he knows about returning kicks. He thinks McClain will make a seamless transition when he inherits the job on a full-time basis in 2008. Brian Brohm may wind up being the No. 1 pick in the 2008 NFL Draft, but I think West Virginia's Pat White will be the most valuable quarterback in the Big East again this season. White, incidentally, was a 27th-round pick of the L.A. Angels in the June baseball draft. He was a fourth-rounder out of high school. You get a lot of time to think about ridiculous things when making a long drive (.... in case you didn't notice). Listening to an array of CDs on the way back from Newport, I decided that if I was a major league closer, my entrance song would be "Wicker Man" by Iron Maiden. Perfect tune for that situation. Worth an out just on intimidation alone, especially if cued up to the "Your time will come" chorus. Some in the bigs needs to adopt this tune, ASAP. They'll immediately become the best in the game. The restaurants in Newport are overpriced and overrated. That's all there is to it. Been coming here for a few years now and still haven't had a decent meal. I gave up today and had lunch at Applebees, which, surpsrisingly, has an amazing new appetizer. The crispy onion rings, which come doused with a smattering of fresh grated Romano cheese, are simply delightful. I felt like I was re-enacting the final scene of the Sopranos by inhaling whole onion rings like communion wafers. In fact, there may have been a suspicious-looking dude in a Member's Only jacket nervously glancing over at me from the bar while "Don't Stop Believin'" was playing on the jukebox. All that was missing was a sudden fade to black. Or maybe I was delirious from devouring the whole plate in 60 seconds flat. I think that's it. If I was a closer I'd go with "All My Life" by the Foo Fighters. When the bullpen door opens, that ominous base line would be tremendous. Plus the chorus of "Done, done on to the next one" is perfect closer mentality. As a newspaper blogger myself, I enjoy reading yours. Nice entry. Welcome back. Let the season begin.